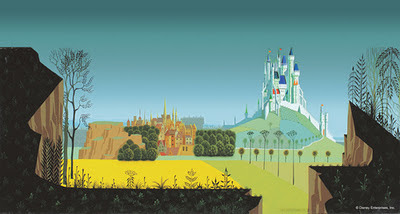 Eyvind Earle was a Disney background artist in the 1950's and 60's. The canon of his work is noted for stark lines and bold contrasting color. His shapes are epic in proportion, and sturdy in their grounding. Whimsical trees, stoic and beautiful animals, and architecture scraping the sky are littered throughout his work. Here are a few of his concept paintings for the 1959 classic Sleeping Beauty. Though Earle is, and always has been, a celebrated Disney background artist, I feel like his notoriety has waned in the aftermath of HURRICANE BLAIR....with which he shares a similar aesthetic value. I had never seen these wonderful paintings, though I'm sure they are old hat to most Disney geeks. Please enjoy them for what they are.